The art of the dress handkerchief doesn’t end with selecting color, pattern, and fabric. Equally important is the way in which the pocket square is worn. A quality pocket square can appear unbecoming if it is improperly handled and haphazardly stuffed into the pocket. That isn’t to say that the handkerchief must appear excessively arranged. Many of the finest pocket square examples have a casual, fluff-like appearance. All well worn pocket handkerchiefs, however, have one thing in common: the wearer knew what he wanted, arranged the handkerchief so, and then wore it as a subtle display of his fashion prowess. Dress handkerchiefs can be arranged in an infinite variety of ways; for simplicity’s sake only the three basic types of pocket square folds are covered here: squared, fluted, and pointed. 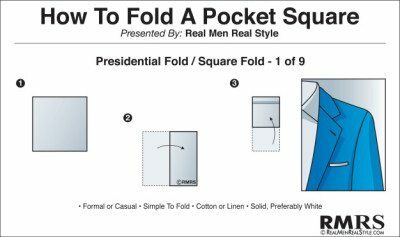 The square handkerchief pocket fold, sometimes called the Presidential or the TV fold, is the simplest and most understated of the folds. In modern times, it is also one of the least often seen. 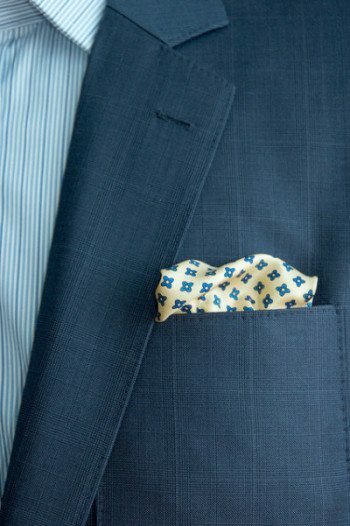 This fold is very similar to the standard pocket square fold of the for-use handkerchief, except that it must be somewhat longer and narrower in order to fit into the pocket and remain visible. 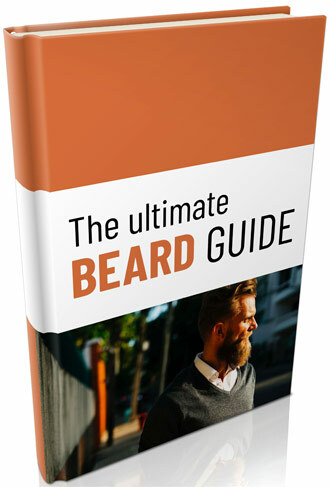 The precise length and width will depend on the pocket in question as well as the wearer’s preference, but it is generally in the area of 5″ – 6″ long and 3″ – 3½” wide. If the handkerchief is made of linen or cotton, it should be lightly starched to provide a crisp look; if it is made of silk, it should not be starched, but should be folded so the hand-rolled edges are visible. 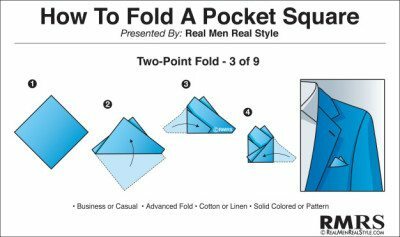 Square Handkerchief Fold Step 1 – To create a pocket square fold, one starts with the handkerchief completely unfolded on a flat surface. Begin by folding it in half so that it is now the same width but half the length. Be sure to crease the edge of the handkerchief fold, and each fold to come. Square Handkerchief Fold Step 2 – Next, fold in half again, so that it once again becomes a square, one-fourth of its original size. Square Handkerchief Fold Step 3 – Finally, fold in half one more time, so it becomes half as wide as it is long. This is then inserted into the jacket pocket with between ½” and 1″ of the handkerchief visible. The finished product can be inserted in many different ways: tilted diagonally is a popular style. Such details are up to the wearer, and it is best to try several options at first to find ones preference. The next style is the flute, sometimes called the balloon or puff handkerchief fold. This style is quite possibly the easiest to create, but the hardest to perfect. It is the least casual of all the pocket square folds, as it literally looks like you nonchalantly threw it into your pocket. 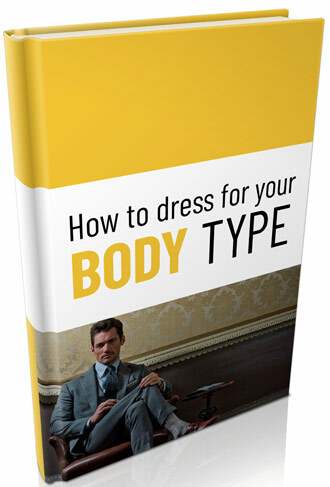 However, this bit of sprezzatura is a planned combination of elegance, grace, and practice. Flute, Balloon, Puff Handkerchief Fold Part 1 – With the handkerchief open and on a flat surface, pinch it from the middle and lift it up. Flute, Balloon, Puff Handkerchief Fold Part 2 – With the other hand, create a ring with the thumb and index finger around the top of the handkerchief, right below the pinch, and pull downwards, forming a column or “flute”. Flute, Balloon, Puff Handkerchief Fold Part 3 – Fold so that about half of the fabric is on the “flute” end, half on the “point” end, and tuck into the pocket, so that 1″ to 1½” remains visible. If necessary, adjust to fill the width of the pocket; should the flute be too tall or too short, re-flute, folding as needed to achieve the desired size. The final style, the two point, is the opposite of the flute handkerchief fold in terms of careful folding, planning, and formality. It is best you use a starched or well ironed cotton or linen pocket square for this particular fold, although with care and practice an attractive two point pocket two point look can be achieved with a silk handkerchief. 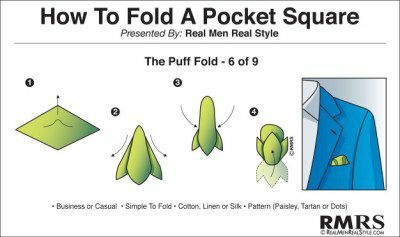 In these photos, we will be showing you how to create a two point pocket handkerchief fold. There are many variations; this one is appropriate for conservative settings and is just a tad flashier than the square pocket fold. Two Point Handkerchief Fold Step 1 – To create a two point handkerchief fold starts with the handkerchief unfolded on a flat table. Fold the pocket square in half, and then fold it again in half lengthwise so that you have a smaller square 1/4 the original handkerchief size. Now slightly slide the top 1/2 to the left or right – these are your points, so the amount to separate them is up to your tastes. Two Point Handkerchief Fold Step 2 – Now start folding the right, left, and bottom corners in so they meet at the middle pf the square. This will be hidden from view, so do not worry about pressing these folds. Two Point Handkerchief Fold Step 3 – Finally, adjust the bottom handkerchief folds as necessary to fill the width of the pocket and to keep the points from clustering too tightly. Place in your breast pocket and adjust. Each fold has its own distinct personality, conveying different messages about the wearer to those he meets. The best approach to finding one’s preferred style is to try different variations and choose the pocket square fold that best complements your personal style.